Since October 25th, the Art Gallery of Ontario has featured a unique exhibit exploring the creative mind behind one of the most inventive filmmakers of our generation: Guillermo del Toro. 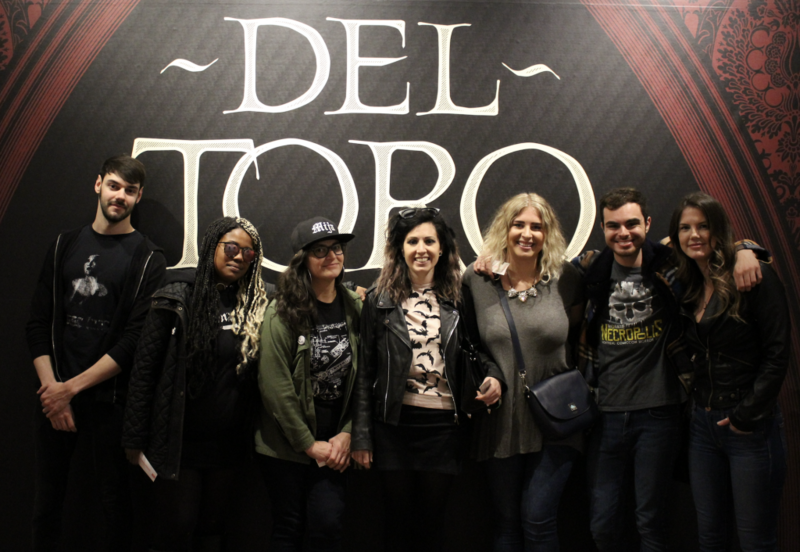 Rue Morgue was fortunate enough to attend the exhibit, and we want to send some of our lucky readers in it’s final weeks (on now until January 7th)! At Home with Monsters is organized thematically, beginning with visions of childhood innocence and the Victorian era; continuing through explorations of death and the afterlife, magic, occultism, alchemy, and monsters; and concluding with a celebration of comics, movies and popular culture. 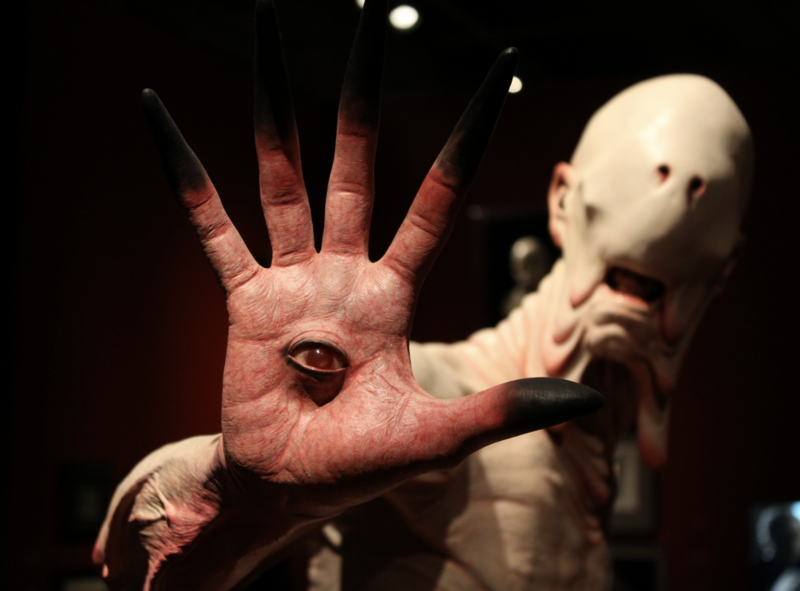 Fans of del Toro can see the props, costumes, and literature behind his filmography, including The Devil’s Backbone, Pan’s Labyrinth, Pacific Rim, Crimson Peak, and many more. Comment below describing your favourite scene and/or moment from one of Del Toro’s films for a chance to win tickets! Contest ends Friday Dec 15th. My favourite del Toro scene is from Crimson Peak when Edith is in a bathtub mindlessly playing fetch with her [newly adopted and VERY sketchy circumstances] dog… She’s playing with the dog and instead of him bringing back the ball something rolls it back to her. It’s just this wonderful blend of playful and horrifying all rolled in to one and why I love his work so much! I’ve loved his work since Chronos. The Devil’s Bsvbone is also one of my favorite films and he captured Mignola’s Hellboy perfectly. My favorite scene of Guillermo Del Toro’s is one he probably doesn’t like which would be the opening to Blade 2. I know he doesn’t like the fight scene in front of the lights but the opening to me really set a tone for the vampire action movie we were all starving for circa 2002 lol. As much as I appreciate his gothic works I was taken more a back by his ability to make a character like Blade or even more so Hellboy really look like they were ripped from the source material staples and all. A favorite moment is in Chronos, when the grandfather/vampire hides from the sunlight during the day in his granddaughter’s toy chest surrounded by her toys and dolls. Guillermo Del Toro has got to be one of my favourite directors. My favourite scene from all his films would have to be the ending of “Pan’s Labyrinth”, which arguably, remains to be his masterpiece: it’s a grand mixture of aching tragedy and splendid beauty. The vital scene in Cronos in the bathroom where he licks the blood off the floor. Everything about the scene is done so well, especially the look of ecstasy on his face as he licks the life off the floor. This was a really tough choice but I’m going to go with my favorite film from him. The ending scene in Pan’s Labyrinth. I’d have to say the scene with the Pale Man in Pan’s Labryinth, partially for its nod to old children’s fairy tales, and also because visually his character was so striking that I had to draw him haha. Such a great film. The toad scene was for some reason one of the most memorable scenes from Pan’s Labyrinth for me. When the toad pukes out the cockroach covered slime and deflates was really cool looking. It also spoke of the protagonist’s determination as well lol. Though not a movie, his work on Silent Hill P.T. also showed incredible promise and it’s a shame that never took of. I know it’s the usual, but the ending of Pan’s Labyrinth is first. I still cry. I love the dreamyness of Crimson Peak. The whole fairytale of girls becoming rich and royal but nothing is what it truly is. He’s an awesome story teller. I think I enjoyed The Devils Backbone best. You don’t truly know what to expect. That’s what I like best. I also thoroughly enjoyed The Strain books. Quite a decent read. I think The Devil’s Backbone is a breathtaking film.